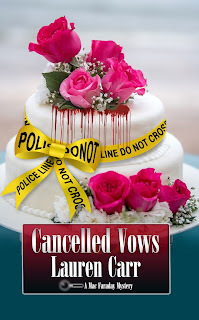 Congratulations to Lauren Carr on the release of the latest Mac Faraday Mystery, Cancelled Vows! 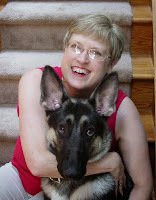 Thank you, Lauren, for sharing an excerpt of the new release with us and our readers! Today, January 28, 2016, marks the release of Cancelled Vows, the eleventh installment in the Mac Faraday Mysteries, and fans of my Deep Creek Lake mysteries are in for a treat! There’s an added treat in Cancelled Vows: Fans are going to meet a new character—and a character she is! Readers may wonder why I would be adding a new character to a series that is already established. The answer is simple really. A series that stays the same book after book tends to go stale, not just for readers, but for the writer as well. In many ways, mystery writers are like movie directors. After coming up with the basic storyline for our murder mysteries, we “cast” the parts to characters. Luckily, we don’t have to deal with agents, lawyers, or actors unions. If a character doesn’t work out—the writer can simply kick a character to the curb and create another character to fill the role. If the writer is lucky, the character will come completely to life and take the mystery in a whole new and exciting direction. When putting together the plotline for Cancelled Vows, I needed an investigative journalist who would stand out in New York City, which in itself is the heart of diversity. Not only did she need to be different from the city slickers, but she also needed to be different enough to attract Mac’s and David’s attentions. Who better to stand out than a country girl—but not a sweet Southern flower—a tough Texan thirsting to uncover the truth about her mother’s disappearance. I was still working on my character’s personality when I started searching for names. Several years ago, I had seen an interview with Elmore Leonard, novelist, short story writer, screenwriter (you name it! ), in which he recounted working on a story in which he had a character from New Orleans, who he had given a French name. He said that as he wrote, this character wouldn’t say anything. Then, Elmore Leonard decided to change his name. From that point on, he couldn’t get the character to shut up. Still in the process of developing this character’s personality and backstory, I was searching for a name when I came upon Dallas. Okay, I confess! I read an interview with actress Bryce Dallas Howard, daughter of director Ron Howard, in which she stated that her middle name (Dallas) was after the city in which she was conceived. Hmmmmm, I thought. How intriguing. How about the first name of Dallas, named after Dallas, Texas, where she was conceived? A search on the Internet bought up Walker as a popular surname in Texas. As soon as I gave this character the name of Dallas Walker, she was born. Like the character in the Elmore Leonard book, I couldn’t get her to shut up—she insisted on telling me everything—all with a thick Texan accent, liberally mixed with little euphemisms and sayings are really adding a lot of levity to the case. Dallas Walker is one sassy character who won my heart, along with the rest of the cast from Deep Creek Lake, the second she shot upon the page. I’m sure you’ll love her, too, as you meet her in this excerpt from Cancelled Vows below. David was aware of Dallas’ following him into the bedroom and closing the door, but he didn’t think anything of it. After all, she needed his undershirt and a place to change her clothes. He turned around to find her standing on the other side of the bed. She had taken off the double-breasted top of her pantsuit. Above the waist, she wasn’t wearing anything but a chocolate-brown silk-and-lace bra. The hue of her underwear matched the brown in her eyes. With a toss of her head, she shook her hair back behind her shoulders, letting it spill down her back, and held out her hand to take the shirt. Stunned by her lack of modesty, David made no move to give it to her. With her calling it to his attention, David had to agree she was right. “That won’t work.” In one movement, she pulled both white shirts off over her head. While David’s mouth hung open, she undid the bra’s clasp between her breasts and shrugged out of it. “I grew up surrounded by rough and burly ranch hands. I would have never survived being prissy and modest.” With a naughty grin, she tossed the bra to David, who caught it with one hand. “Souvenir of your trip to New York,” she said with a wink. “And all I was looking to take back to Deep Creek Lake was a divorce.” David tossed the bra into his overnight bag. Hands on her hips, she cocked her head at him. “Dude! How do you get married and not know it?” Her tone was filled with doubt. Her hand shot up. “’Nuff said!” She strapped the belt that she had previously worn on her pants around her waist to cinch in the men’s white button-down shirt that hung down low enough to cover her hips. She left the top four buttons undone to show the white undershirt beneath. With only a few pieces of clothing, she had transformed her look into stylishly casual. David went into the bathroom to go through his shaving kit. He returned with an old, worn rubber band to find that she had begun French braiding her hair from the crown. “I have no idea where this came from.” He held out the band to her. “It means don’t get your boxers in a wad,” she said to his reflection in the mirror. “I’ll take that as a compliment, handsome sir,” she replied to his reflection in the mirror.